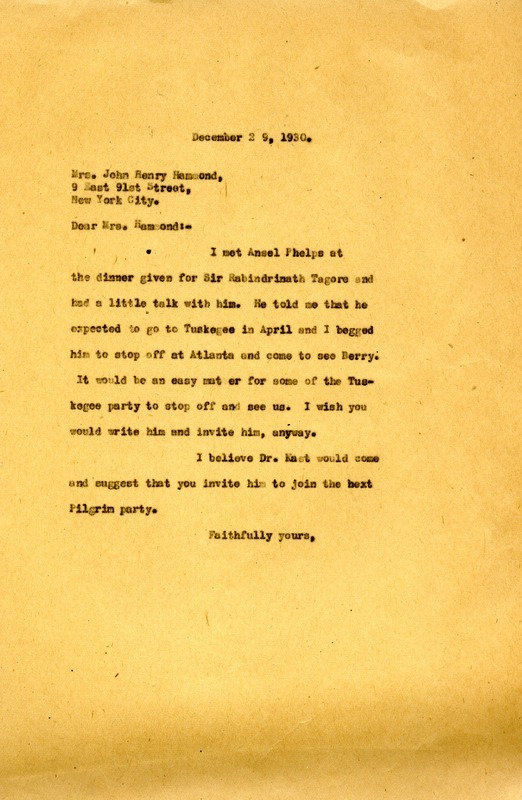 Berry inform Hammond that she met Ansel Phelps at a dinner given for Rabindranath Tagore. She says that during their conversation, he informed Miss Berry that he was going to Tuskegee that April and she asked him to stop in Atlanta and see Berry. She states that it would be easy for members of the Tuskegee party to come and see the schools. She asks Mrs. Hammond to write and invite him to the next Pilgrim Party. Martha Berry, “Letter to Emily Vanderbilt Hammond from Martha Berry.” Martha Berry Digital Archive. Eds. Schlitz, Stephanie A., Sherre Harrington, Haley Fortune , et al. Mount Berry: Berry College, 2013. accessed April 24, 2019, https://mbda.berry.edu/items/show/12906.